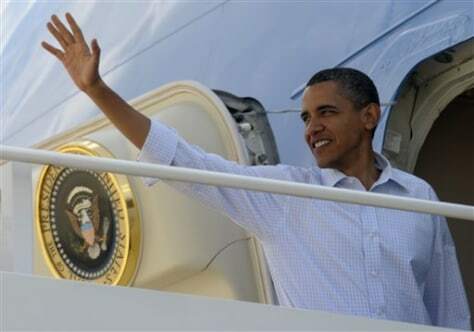 President Barack Obama waves from Air Force One at Andrews Air Force Base in Md., on Saturday, bound for a weekend in Panama City, Fla. The first family, absent Malia who is at summer camp, plans to spend time enjoying the area's recreational activities. But the president has also scheduled a meeting with small-business owners as the government's focus moves from plugging the oil leak to rebuilding the region's economy.